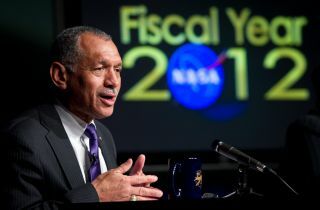 In 2009, Charles Bolden became NASA's first black administrator. The former astronaut, a veteran of four space shuttle flights, is helming the space agency as it transitions through hard economic times and the looming retirement of the space shuttle program. It's a long way from the segregated south to low Earth orbit. But I am fortunate to have made the journey and to have had many opportunities to serve my nation in a 34-year career with the U.S. Marine Corps and in many roles at NASA, currently as head of the nation's space program. When I was a young man, my service as NASA's first African American administrator under the nation's first black president would have been nearly unthinkable. But through the efforts of many people of all races, our nation has changed. And, thanks to the space shuttle program, and NASA's cross-disciplinary exploration missions, African Americans and many others have had access to space and also to science and technological careers. The shuttle was really instrumental in breaking the color barrier for African Americans in space, and it all happened without a single law being passed. Today, African Americans are scientists, engineers and astronauts. They're developing instruments for spacecraft to peer beyond the edge of our solar system and opening solar arrays on the International Space Station with just a tether holding them to a vehicle moving nearly 17,000 miles per hour. NASA is reinvigorating its focus on research and development to develop technologies that don't exist today. We will send humans farther and faster into space. We'll visit places we've never been with people and robots, launch science missions to uncover unfathomable secrets of the universe and make air travel safer and cleaner here on the home front. African Americans have been, and will continue to be, key to all of these efforts. I might never have had a chance in space were it not for the late great Ron McNair, another African American pioneer in exploration who encouraged me to apply to the astronaut corps. I was being a naysayer, thinking there was no way I would be accepted. But Ron persisted, and I am grateful to him to this day and for all of the life and professional learning he shared with me in his too-short time before he was lost in the Space Shuttle Challenger tragedy. Ron was my "Sputnik moment." Since America's "Sputnik moment," when the nation stood up and took notice, and made a decision to commit to exploration and the technology development and innovation that would be required, many African Americans have given their heart and soul to the space program. The list is long at NASA. Astronauts like Guion S. Bluford, Dr. Mae Jemison, Frederick D. Gregory, and Dr. Ronald McNair and Michael P. Anderson, to name just a few, pioneered a path in space. Similarly, scientists like astrochemist Dr. Emmett Chappelle, who was inducted into the National Inventors Hall of Fame, and Dr. George Carruthers, who helped our Apollo missions be more than just flags and footprints, and Dr. Harriett Jenkins, who helped diversify the agency as head of its Equal Employment Programs, made vital contributions to the space program. Without the historic contributions of these and many others, NASA would not be the agency it is today. For my part, my parents were probably the biggest influences on my life. Not only growing up, but still, today, as I make decisions as a husband, grandfather, father, brother and leader. My father was a teacher, my mother a librarian. Learning was always at the forefront of our lives as well as a commitment to public service. That led me to the military and a chance to serve my country as my father and my uncles had done in World War II when blacks had to fight for the right to serve in our armed forces. I wanted to follow in the footsteps of so many African Americans who had already served this country with distinction, if not always with recognition. For me, it was an uphill battle. Because of my race, no one in my South Carolina congressional delegation would provide an appointment nor nomination to the Academy as was required for admission. I wrote President Lyndon B. Johnson asking for help, and that's when Congressman William Dawson of Illinois provided me the appointment I needed to be accepted. Rep. Dawson was himself a veteran of World War I, and only the third African American elected to Congress in the 20th century. He was the only serving black member during his first term. Since then, I graduated from the U.S. Naval Academy, flew more than 100 combat missions over Vietnam, earned a master's degree in systems management, flew on the space shuttle four times, and rose to the rank of major general in the U.S. Marine Corps. It has been quite a ride, but I couldn’t have done it without all those who came before. That's why I tell today's young people that I hope they will take the gains that previous generations have made and make their own progress. Students ask me how to become an astronaut. I tell them to pursue any of the paths in science, technology, engineering and mathematics and their chances of a strong, secure career that makes contributions to our economy and improves life for people worldwide will be possible. When I speak to young people, I tell them, don't waste your time trying to explain yourself or your identity to anyone or justify why you are where you are -- in the workplace or anywhere else. Do your job and do it very well. Live your life according to the golden rule and the strong principles taught by Dr. Martin Luther King Jr. Always remind yourself of "why" you are pursuing the things you do. Stay in touch with that answer, and don't let others define it for you. I never really left Columbia, S.C., behind. The family and teachers and friends that are still there remind me of who I am, where I come from, and what my ideals should be. It was a fortunate upbringing in many ways, despite the hardships. I wouldn't change a thing. And despite what some might say, the future is bright for the young people just entering the workforce today. I hope I have had some small part in the progress this nation has made. I look forward to the space program's continued success improving people's lives around the world through new technologies and discoveries and showing that with innovation, creativity and passion, you can knock down any barrier of race, ethnicity, creed, or gender.